52 Quilts in 52 Weeks: Ho Ho Ho . . . It's Beginning to Look a Lot Like Christmas! Ho Ho Ho . . . It's Beginning to Look a Lot Like Christmas! Welcome to the 52 Quilts edition of the Ho Ho Ho Blog Hop. 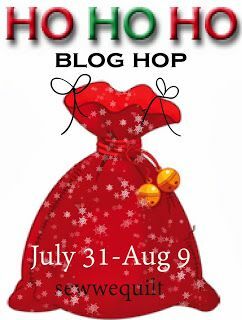 What a great way to get a jump-start on the Winter holidays -- commit to a holiday blog hop in August! My blog hop project is also the December Jelly Roll Party sample, so I'm ahead of the game there also. The pattern is "Tea Party," from Cluck Cluck Sew. My friend Jeannie always invites me to a holiday tea in December, so I thought this pattern was particularly appropriate for December. I used a new line from Moda, "Winter Lanes." I like this collection because it's wintery, but not specifically "Christmas." I made my quilt longer than the pattern, it's an extra-long twin size. Just right to take to quilt camp next summer! So long it had to hang over the deck to get a photo of the whole quilt! Of course, I bound it using Susie's Magic Binding. If you haven't tried this technique yet for binding, here is the tutorial. If you like the look of the contrasting flange, or if you just don't like hand-stitching down bindings, Susie's Magic Binding is the technique for you! And of course, I had to add a "My Aunt Martha Made It" label. My sister made this Teddy Bear from one of my Daddy's Pendleton shirts. Doesn't he look comfy? Here is the best shot I have to show the true colors. I quilted it with "random squares" using Superior Threads "Omni Thread" in Fountain Mist. Because it's a winter quilt, I used a thicker cotton batting than usual. I hope you'll drop by and see what they made! "Tea Party" is such a fun quilt, I think I should give away a PDF copy of the pattern! It's a NEW copy (see comment #71) not my paper copy with my notes scribbled over it! I really like your quilt, the pattern, the colors, just lovely. I also really like that the border matches the background. Gives the appearance of no borders. My Grandma made quilts the same way. Thanks for the link, I'll have to give that technique a try. What a great fabric line... And I do love that binding technique!! Thanks for shareing! Very pretty. So happy to be hopping through here today. You made a wonderful quilt. Love your quilt it looks fabulous. I love the 'Winter Lanes' fabric as it is wintery but not Christmas. The winter goes on a lot longer than just the Christmas season. Your quilt is so wonderful. I have started my Christmas sewing with my Angel topper and will continue with some mug rugs. Gorgeous quilt draping the verandah! Love that quilt, and LOVE the binding!! I've been doing quilted potholders and zipper bags to put away for Christmas, and have squares cut out for a quilt, although that project isn't moving too quickly. Good thing Christmas comes every year, lol! Great quilt and yes the holiday prep has begun! Thanks for offering the great giveaway. Love your quilt! I have not used that binding technique yet, but plan to use it on my next quilt. Thanks for sharing! Oh, this is gorgeous...I love your quilting! I have only started on my Christmas quilting because of the hop, lol! Beautiful quilt! You really did a great job!!! Lovely quilt - the colors are beautiful. I have several Christmas quilt tops finished - just need to do the quilting. Thanks for the giveaway. Love the quilt and you are right---the fabrics do not scream Christmas so you will get a longer use from them, into the winter months. I DO have some more holiday sewing to do before I send my entries off to the giftees but I dream of finishing up a holiday row quilt I had participated in years ago. Or the partially done sampler I have been talking about for years. THX for the giveaway opportunity! Sweet of you to offer. There was a glitch in your link (looks like it worked for some people) but it is fixed now. Your quilt is beautiful and I love that method for binding a quilt--I use it a lot! Thanks for hopping with us! Oh, that fabric is so pretty and that pattern shows it off so well! I sure did start my holiday quilting. I made all kinds of stuff for ME!! !hehehe Now it's time to start on the presents for others! Beautiful quilt and that fabric is yummy! I haven't started my holiday quilting.....need to get started! Thanks for sharing! That is really pretty. I just did that binding on a quilt and loved the technique. I'm glad you showed it again because I couldn't remember where I saw it (I hate when I do that). I had to figure out my own math to make it since I didn't have the instructions. I haven't started my Christmas quilting yet. Is it really August already? I haven't gotten started I am too busy trying to finish my other quilts before I start a new one! Not only a fun quilt, but what fabulous colors! Love "Winter Lanes"! I love your quilt Marti - the fabric you chose is fabulous! I haven't started my Christmas sewing yet - I've got 2 wedding quilts and a baby quilt to finish first!! Well, I am making Tammy Bags and although they were supposed to be for birthdays, they are probably going to be gone at Christmas. 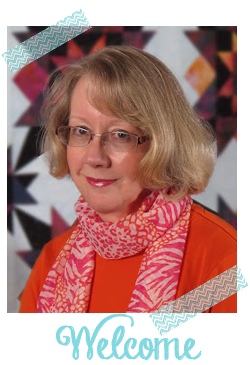 I sure do love your quilt, I like the idea of winter themed fabrics rather than Christmas, you can use it for a much longer time! Beautiful work! Good for you, Rose Marie! So glad you like the quilt, good luck in the giveaway! That is a beautiful quilt ! I like your style.. I have not started my Christmas quilting yet but this blog hop is getting me excited. Cute quilt! Love your fabric choice for your quilt. I'm thinking that I should do one of my UFO Christmas kit that I've had for many years. Julia, sounds like you need to join the 13 in 2013 UFO Challenge! So beautiful! I would love to make one! I have not started with two August birthdays I am busy! Ho Ho Ho to you! I was just thinking of sending you a request for the pattern! Love it and the colors. Martha, glad you like the pattern. Good luck in the giveaway! Gorgeous quilt and I'm intrigued by and off to read about that binding. I have pulled out a Christmas UFO so I can get it off to the LAQ before the year end rush - so yes I have started (barely!). I have not yet started my Christmas quilting. I should really finish spring's first. Ugh. Got to get working with you on my UFO projects! Yes, Amy, you should take up the 13 in 2013 challenge! We'd love to see your finishes! Love the pattern and the original quilt AND your holiday one!! What a lovely, lovely quilt. I especially like the modern holiday fabric colors. Very nice. Thanks for sharing! Thank you for your nice comment! I love that fabric line -- probably will have to get more! I haven't started my christmas quilting yet. I usually give everyone ornaments instead. Quilts take me a significant amount of time to finish. Love love your kwilt...it should have been in the top picks today! Great pattern! Hope I win! Love the quilt, thanks for the chance to win the pattern. I haven't started my holiday sewing yet. I plan to make table runners and mug rugs this year. I love the colors you chose! Beautiful quilt! Beautiful quilt - the colours are so pretty. It's winter here for us and we've just finished a short holiday so we will probably draw out some stitcheries for Summer at Christmas time. Thanks for the giveaway. The colors are so neat for that pattern. Beautiful. Well, yes, sort of started. I keep getting distracted by UFOs. Maybe some of them will become Christmas gifts. Love your modern holiday quilt. What a lovely cheery quilt! I love the fabrics. Well done. Thank you -- I love this collection, too! What a great quilt you made - I love the color choices. Thanks for sharing. I really like that fabric too, such beautiful colors. What a great quilt. I like how you made it longer. That teddy bear is so wonderful. I have not gotten anything started yet this year although I have started my list so I will have an idea what I'll hopefully make for each person so that's further than I was a year ago. I am so glad that we got the right link for this! What a beautiful quilt that is. I have started...... I had a whole week of Christmas, because of the hop. The thing I didn't finish was my Wish quilt. I started it last August (a BOM over at http://www.red-brolly.com) and started quilting under the Christmas tree. Sadly I lost steam in January. I still need to get the last bit quilted. It will be ready for this Christmas. And the next one (featured in Homespun over a number of months) will be started.....for my sister! Tea Party is a neat design, and I like the fabric you chose for your version. Love the picture of your quilt and the Teddy. And yes, I have been working on Christmas quilty things because I am part of a Christmas QAL. I love the design and fabrics of your Tea Party quilt! I've definitely been working on Christmas items--I am a part of this hop! Thanks for sharing your lovely quilt! HI Marti..just asking here to be on the safe side...you are sending a NEW purchased copy of this pattern from Cluck Cluck Sew ? 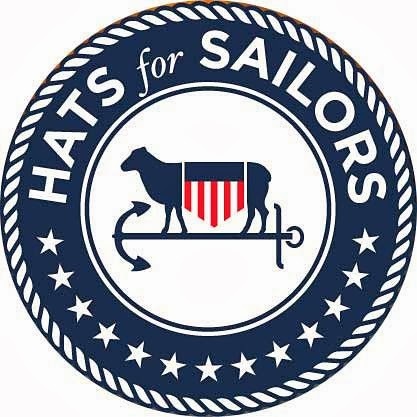 This pattern will be forward by Cluck Cluck SEW directly? Your quilt is beautiful!!! I have started on some of my holiday sewing. I have so much more to do. I love doing these hops because it gives me deadlines to get things done! Thank you for sharing, happy quilting! What a beautiful quilt! I haven't started my Christmas items yet. We just got back from vacation. But I have several UFO Christmas items that I told myself I have to finish before I start anything new. I have been seeing some really cool stuff on this hop. I'm going to get cracking on those UFO's so I can start some new stuff! I love your quilt very pretty. I'm new to quilting but I took some classes and made a very pretty purple quilt that is ready to go to the quilter on Monday it's for my Darling husband for Christmas. Usually he is last in line to get something home made but this time I put him in 1st place. He has even been helping me with color and size and has no idea its for him. That is a lovely quilt! I have never heard of the binding you did, but will definitely try it! I have started for Christmas, but I am glad that there are several months to go yet! I love your great motivational 13 in 2013! What a great quilt. I just keep seeing crosses. I think that is a wonderful symbol of Christmas. My ex-husband (since December and we were still friends) was found dead in his apartment on Tuesday. I actually feel more like a widow than an ex-wife right now. Anyhow, he was a Christian and loved quilts. If I am lucky enough to win the quilt, I plan to make a quilt from the pattern and donate it to charity in his memory and honor. You are generous to host the giveaway. Thank you participating and sharing your creativity. I love the colors and fabrics in the quilt. This is a great quilt! Great job! Also, thanks for the tutorial on the double binding. I love the way quilters share ideas with each other! I haven't started making anything for Christmas but I need to get busy making aprons for some very good girls this year! Very nice quilt. I love the binding. Teddy is sew cute too! no I haven't done any Christmas projects yet. I would love to win your pattern I really like it. Thanks for all the fun. Love the teddy bear. Spectacular quilt and the binding is perfect. I finished up 2 grandbaby Christmas stockings but there wasn't much quilting on them - more embroidery. I thinking of several projects I need to get going on. Your quilt is beautiful! I love the fabrics you used. I have started a small hand embroidery project for Christmas and I am also making a block each month for a Christmas quilt. Thanks for sharing and for the giveaway. Love Cluck Cluck Sew patterns! Your Tea Party quilt is lovely. I have seen this fabric line in the store and its truly beautiful. Great choice for a winter quilt. I love your quilt. Cluck Cluck Sew has such wonderful patterns. Can't wait to get sewing for Christmas. Maggie, I'm sorry I have to reply in the comments -- I couldn't find an email address for you! Thanks for commenting, good luck in the giveaway! What a beautiful color scheme and quilt! I've started the Christmas quilts .. One for my Hubs ... Superman!! And one for my 14 y/o niece -- which I'm getting some help from my online Bee ladies to make it a bit easier on me. Yes, I'm busy on my holiday sewing. I will be giving lots of lap quilts as gifts this year. Love your tea party quilt. Thanks for sharing the tut. I've just barely started, thanks to this blog hop. I have some wedding gifts I'm working on for 2 nieces weddings sept and Nov, so no more Christmas till they are finished. I'd love the chance to win. It's a great pattern. I love that fabric line. Thank you! Yes I've started my Christmas Quilting.... Thanks to this blog hop! It is strange to be sewing with Christmas fabrics, while canning blackberry jelly! Your quilt is lovely. I love the teddy bear too. I've been Christmas sewing since January! Beautiful quilt, great pattern. Thanks for sharing! I have started! There is so much to do, but I'd love to use this pattern for at least one of my projects! Your quilt is gorgeous and I love the fabric you have used. I have started with some Christmas sewing. I have made a door knob hanger and mug rug for a friend. Love your quilt and am looking forward to checking out the binding tutorial. Thanks for sharing. Very pretty!! Thanks for the binding link. I haven't started Christmas quilting yet, but thinking about sewing some Christmas pillowcases for my kids. Very pretty quilt. I have not actually started yet to sew for Christmas but have gotten some fabrics and patterns out. I did make one ornament so I guess that counts. I like the random squares in this quilt. Please sign me up to WIN! I need another Christmas Quilt.